Despite its current vibrancy, Jewish Boston got off to a slow start. In fact, the first Jew, Solomon Franco from Portugal, arrived in 1649, only to be shown the door 12 days later after a business tussle with the colony’s major general. The next recorded Jewish resident stayed longer. For Italian Judah Monis, the cost of taking a job as professor of Hebrew at Harvard University in 1722 was conversion, a price he later insisted he was happy to pay. But in 1762, after being denied citizenship in Rhode Island, Aaron Lopez was not only allowed to become a citizen of Massachusetts, he was also permitted to strike the phrase “upon the true faith of a Christian” from his loyalty oath. Still, while neighboring American cities saw the growth of Jewish communities in the late 1700s and early 1800s, it was not until 1842 that the first congregation, Ohabei Shalom, was formed in Boston, moving into a permanent home nine years later on what is now Warrenton Street. 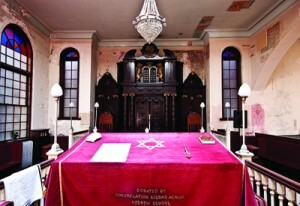 The Reform Temple Israel began life in 1854 in the South End as a breakaway from Ohabei Shalom. It now boasts a sprawling building poised between Boston and Brookline just to the west, down the street from Longwood’s Hospital Row. Mishkan Tefila, New England’s first Conservative congregation, was formed in 1858 and now occupies a wooded corner of Chestnut Hill, which straddles the area’s two largest Jewish population centers, Brookline and Newton. Yet by the 1860s, at a time when New York boasted 40,000 Jews and Philadelphia and Cincinnati 10,000 each, Boston was home to just 1,000. Then things took off: On the eve of World World I, Greater Boston numbered some 100,000 Jews, and the community was home to more than 500 synagogues, charities, cultural and self-help groups designed to acclimate the newcomers into American life as well as Yiddish newspapers and theaters, kosher butchers and grocers. Businesses also thrived: In 1909, Edward Filene made retail history with a bargain basement beneath his father’s downtown department store. Boston is where the nation’s first Jewish federation—now Combined Jewish Philanthropies—was founded in 1895, the first Bureau of Jewish Education opened its doors in 1921 and the only Jewish-supported nonsectarian institution of higher learning, Brandeis University, was established in 1948 as a defense against punitive Jewish quotas in many top schools. And in 1916, Beth Israel Hospital also got its start here in part because Jewish doctors were not welcome to practice in other area hospitals. Much of Jewish Boston’s growth originally centered around the city’s North and West Ends, moving on after World War I to Roxbury, Dorchester and Mattapan, where from the 1920s through the early 1960s nearly half of the area’s Jews lived. Following World War II, Jews began to move to the suburbs, and today large pockets of Jews exist everywhere from nearby Brookline and Newton to Lexington, Framingham, Sharon (roughly half of whose 18,000 citizens are Jewish) and beyond. Today, nearly a quarter million Jews call Greater Boston home. And, with the full spectrum of synagogues and 14 thriving day schools, the region is a vibrant, innovative center of Jewish life. But, whereas the city of Boston once boasted more than 50 synagogues, of the 100-plus currently operating in the region, only three exist within city limits. The epicenter of Jewish Boston today is the Coolidge Corner area of Brookline. However traditional the neighborhood, visitors will find several up-and-coming religious resources nearby: the Washington Square Minyan (www.wsminyan.org), with services held at two Brookline Hebrew Senior Life facilities; the egalitarian-yet-traditional Minyan Shaleym at Temple Sinai (50 Sewall Avenue; www.minyanshaleym.org); and Moishe/Kavod House (165 Winthrop Road; 646-408-6160;www.kavodhouse.com), engaging young adults in religious discovery and social justice, Friday night services and vegetarian potlucks. 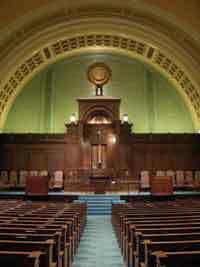 In addition, more conventional congregations, such as the Conservative Congregation Kehillath Israel (384 Harvard Street; 617-277-9155; www.congki.org), built in 1925 around the corner from John F. Kennedy’s birthplace, and Beth Pinchas Chassidic Center of the late Bostoner Rebbe (1710 Beacon Street; 617-734-5101; http://congbaispinchas.com) continue to attract Jews of all ages. Combined Jewish Philanthropies raised more than $40 million during its 2010 Annual Campaign. The organization is dedicated to caring for the vulnerable, forging strong connections with Israel and inspiring the next generation to embrace Jewish life and learning. Its longtime president, Barry Shrage, is known as one of most original and forward-thinking federation leaders today. 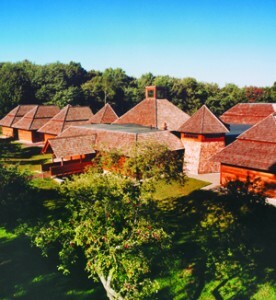 The area’s largest Jewish community center is the Leventhal-Sidman JCC in Newton (333 Nahanton Street; 617-558-6522;www.lsjcc.org). The center offers a full menu of activities for all ages, including an indoor pool, fitness facility, classes, workshops, a kosher restaurant and holiday celebrations, and it hosts the Jewish Theatre of New England and the Magic Ark Children’s Theatre. The Boston chapter of Hadassah (617-566-0666; www.boston.hadassah.org) is a particularly active one—its eight groups and councils boast a total of nearly 4,000 members. They are proud not only of being the home of current Hadassah National President Nancy Falchuk but of the chapter’s many firsts: Boston originated the Life Membership and Associates programs as well as the Nurses’ Council, which Falchuk got off the ground in 1990. Several area universities feature standout Hillels, including Harvard (http://hillel.harvard.edu), Boston University (www.bu.edu/hillel), the Massachusetts Institute of Technology (http://web.mit.edu/hillel), Tufts University (www.tuftshillel.org) and Brandeis (www.brandeishillel.org). Among the graduate programs at Newton’s Hebrew College (617-559-8600; www.hebrewcollege.edu) are transdenominational rabbinical and cantorial schools. Its Prozdor program enrolls 800 teens in post-bar/bat mitzva classes, and the two-year Meah program offered with CJP inspires hundreds of adults with courses in Jewish history and thought. Learning is also key to the mission of Mayyim Hayyim Living Waters Community Mikveh and the Paula Brody & Family Education Center (617-244-1836; www.mayyimhayyim.org). Located in Newton at 1838 Washington Street, Mayyim Hayyim has expanded the use of the mikve, appealing to traditional and liberal Jews alike with rituals to mark many of life’s passages. In addition to its educational programs, a gallery displays rotating exhibits. A joint venture of Reform, Conservative, Orthodox and Reconstructionist congregations, the Synagogue Council of Massachusetts (617-244-6506; www.synagoguecouncil.org) conducts programs, professional training and Unity Missions that bring Jews together to build understanding and peoplehood. Each December 25, its Project Ezra sends hundreds of volunteers into soup kitchens, nursing homes and elsewhere. The Jewish Advocate (www.thejewishadvocate.com)—available at kosher grocery stores, restaurants and community centers—has been the go-to source for Jewish Bostonians for more than 100 years. And visit www.jewishboston.com or www.shalomboston.com for a schedule of lectures, films, programs and performances. Strolling up Harvard Street in the Coolidge Corner area, you will encounter an array of kosher pizza, Chinese food, ice cream and falafel options, ending with Rubin’s (617-731-8787; www.rubinskosher.com), the city’s first kosher eatery, still serving its sky-high corned beef sandwiches and matza ball soup. There you will also find kosher groceries, bakeries, The Israel Book Shop and, just across the street, Kolbo’s Fine Judaica. Reform Ohabei Shalom’s current home, the stunning Byzantine-Romanesque building at 1187 Beacon Street in Brookline, built in 1928, is widely considered to be one of the nation’s great domed religious structures. But the earliest centuries of Jewish life in Boston for the most part never touched Brookline’s borders. Remnants still can be found if one looks carefully at the buildings in Roxbury, Dorchester and Mattapan: Jewish stars still adorn the old Mishkan Tefila on Seaver Street in Roxbury, today home to the United House of Prayer for All People church. Going to see the Blue Man Group? Check out the spot on the Charles Playhouse door post where the mezuza once welcomed worshipers to the second edifice housing Ohabei Shalom. When it comes to newer structures, the offices of Haifa-born architect Moshe Safdie are just north of Boston in Somerville. Locally, Safdie’s designs include the Peabody Essex Museum in Salem and, closer in, the stunning glass cylinder-and-pyramid Class of 1959 Chapel on Gordon Road on the Harvard Business School campus. 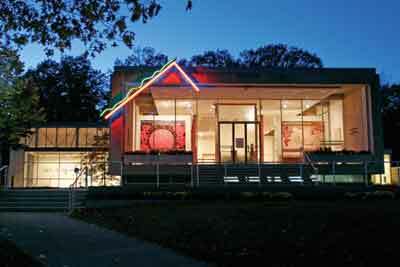 The Rose Art Museum at Brandeis University. Photo courtesy of Mike Lovett. Art lovers may wish to head west to Brandeis’s Waltham campus (781-736-2000; www.brandeis.edu). After a flurry of controversy two years ago about a threatened closing, the university’s Rose Art Museum remains open to the public. The museum’s permanent collection of contemporary art includes works by Willem de Kooning, Jasper Johns, Roy Lichtenstein and James Rosenquist. The school bears the name of local adopted son and United States Supreme Court Justice Louis Brandeis. The campus is also home to the Hadassah–Brandeis Institute, which explores the roles of Jews and gender in research, publications and exhibits. The school’s library has one of the world’s top collections of Judaica. Back in the city, tourists walking the Freedom Trail (www.thefreedomtrail.org) can take a short detour to the six towers of the New England Holocaust Memorial (www.nehm.com) in Carmen Park on Congress Street. Here, the atrocities of the Nazi regime create a stark contrast with the freedoms pledged during the American Revolution in nearby Faneuil Hall. Since 1995, the memorial has stood as a potent reminder, with Stanley Saitowitz’s powerful design inviting thousands of visitors each day to pass through its towers, each symbolizing a major death camp. A total of six million numbers are etched on the glass towers, interspersed with poignant quotes representing both victims and rescuers. A couple of miles away in the Beacon Hill neighborhood is one of the few surviving immigrant-era synagogues in the United States. The Vilna Shul, Boston’s Center for Jewish Culture, at 14-18 Phillips Street (617-523-2324; www.vilnashul.org), welcomes thousands of visitors each year to its Boston Jewish history exhibit and original sanctuary, where the ghosts of those Vilna natives make their presence felt in the ancient pews, time-worn walls and massive Aron Kodesh. It is here that a new generation finds their Judaism—and each other—through Havurah on the Hill’s Shabbat meals, services, classes and lectures. Among the boutiques and art galleries on Newbury Street, just off Boston Common, is the Pucker Gallery (171 Newbury Street; 617-267-9473;www.puckergallery.com), which began life as an Israeli print gallery in 1967. For 40 years it has also carried the powerful Holocaust-inspired paintings of local survivor Samuel Bak. See, too, the work of Israeli artists Shraga Weil and David Sharir, on display from December 4 to January 10, 2011. For 18 years, November has meant the return of the Boston Jewish Film Festival (617-244-9899; www.bjff.org). Featuring a roundup of contemporary films exploring Jewish identity and experience around the globe, the festival sponsors screenings throughout the Boston area, this year from November 3 to 14. Jews enjoy a musical presence at the Boston Symphony Orchestra, where James Levine is the music director, and at the Zamir Chorale of Boston, under the baton of Joshua R. Jacobson, which regularly performs a heady mix of classical, jazz, contemporary and Yiddish and Ladino folk music (617-244-6333; www.zamir.org). The New Center for Arts and Culture (617-531-4610; www.ncacboston.org) offers a menu of innovative programs that explore universal themes in visual and performing arts and the humanities through a Jewish lens. Cross the Charles River to Cambridge for the Semitic Museum at Harvard (6 Divinity Avenue; 617- 495-4631;www.semiticmuseum.fas.harvard.edu), focusing on the archaeology of ancient Israel and the Near East. One permanent exhibit takes a detailed look at daily life in ancient Israel. While in Cambridge, stop by Harvard Hillel at 52 Mt. Auburn Street for its kosher buffet, popular with students and visitors alike. A reservation for meals is needed for Shabbat and holidays. The National Yiddish Book Center. Photo courtesy of Ned Gray. Two hours west on the Hampshire College campus in Amherst is the National Yiddish Book Center (413-256-4900;www.yiddishbookcenter.org). The center and its founder, Aaron Lansky, have been rescuing Yiddish books since 1980. The collection of one and a half million volumes has now found a permanent sanctuary at the center, a resource for researchers and the public. In addition, a digital Yiddish library promises to preserve them for future generations. Rabbi Joseph Soloveitchik (1903-1993), a guiding light of Modern Orthodoxy, lived in Boston, founding the coed Maimonides School in 1937 in Brookline. The Bostoner Rebbe, Levi Itzchak Horowitz (1921-2009), helped define Hasidic life for a new generation of Americans. And Harold Kushner, rabbi laureate of Conservative Temple Israel in Natick, sent out a wave of comfort with When Bad Things Happen to Good People (Random House) as well as later titles. In the world of entertainment and media, composer Leonard Bernstein (1918-1990) and actor Sophie Tucker (1884-1966) hailed from Boston, as do actor Leonard Nimoy and news personality Barbara Walters. The Super Bowl champions the New England Patriots are owned by Jewish philanthropist Robert Kraft; his wife, Myra, recently ended her term as chair of CJP. Baseball wunderkind Theo Epstein manages the Boston Red Sox. Award-winning authors Elie Wiesel and Anita Diamant call the area home, as does legal eagle and writer Alan Dershowitz. United States Senator John Kerry’s Jewish grandparents emerged as a campaign issue when he ran for president in 2004. The bulk of the area’s kosher (and kosher-style) restaurants are concentrated in Brookline, particularly near the Harvard Street corridor around Coolidge Corner. The newest addition is Jerusalem Pita (10 Pleasant Street; 617-739-2400;www.jerusalempita.com). Nearby hotels include the Holiday Inn at 1200 Beacon Street (617-277-1200) and Courtyard by Marriott at 40 Webster Street (617-734-1393). If you need to be farther west, check out the Four Seasons Kosher Bed and Breakfast at 15 Madoc Street in Newton (617-928-1128). If you have seen the comedy spoof Borat, you know the place. Downtown, the Milk Street Café at 50 Milk Street (617-542-2433; www.milkstreetcafe.com) offers a dairy menu of wraps, salads, pizza and soups. Note: The eatery closes at 3:00 P.M. weekdays and remains shuttered on weekends. 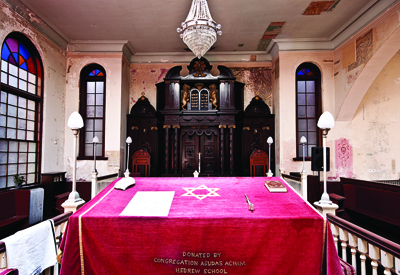 For an up-close look at old and new Jewish Boston, take the Jewish Cultural Walking Tour, which includes stops at the Vilna Shul, the New England Holocaust Memorial and explanations of old Jewish life in the North and West Ends (866-WE-WALKS; www.bostoncitywalks.com). To get a feel for more of the city’s history, catch a trolley tour at South Station (www.trolleytours.com/boston), or take a Duck Tour on a World War II-style amphibious landing vehicle from late March through late November (www.bostonducktours.com). Two books in Brandeis’s series on American Jewish history feature a local accent: An American Orthodox Dreamer: Rabbi Joseph B. Soloveitchik and Boston’s Maimonides School by Seth Farber and Becoming American Jews: Temple Israel of Boston by Meaghan Dwyer-Ryan, Susan L. Porter and Lisa Fain Davis. Learn more about local Jewish history from The Jews of Boston (Yale University Press), a collection of historical essays originally published in 1995 and recently revised; its editors include Brandeis Jewish history professor Jonathan Sarna, professor and curator Ellen Smith and writer-designer Scott-Martin Kosofsky.